Also, recall that the NPV at a sales level of 85 boats was $88,720, and that the accounting break-even was 60 boats. An option available to Wettway is to subcontract production of the boat hull assemblies. If the company does this, the necessary investment falls to $3,200,000 and the fixed operating costs fall to $180,000. However, variable costs will rise to $25,000 per boat because subcontracting is more expensive than producing in-house. Ignoring taxes, evaluate this option. What has happened? 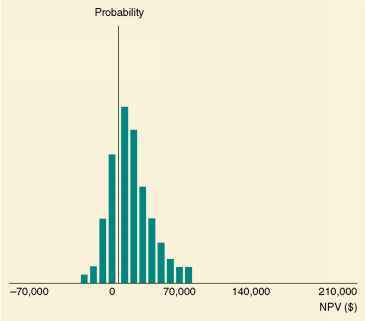 This option results in a slightly lower estimated net present value, and the accounting break-even point falls to 55 boats from 60 boats. Given that this alternative has the lower NPV, is there any reason to consider it further? Maybe there is. The degree of operating leverage is substantially lower in the second case. If Wettway is worried about the possibility of an overly optimistic projection, then it might prefer to subcontract. There is another reason why Wettway might consider the second arrangement. If sales turned out to be better than expected, the company would always have the option of starting to produce in-house at a later date. As a practical matter, it is much easier to increase operating leverage (by purchasing equipment) than to decrease it (by selling off equipment). As we discuss in the following pages, one of the drawbacks to discounted cash flow analysis is that it is difficult to explicitly include options of this sort in the analysis, even though they may be quite important.